In keeping with our commitment to monitor the impact of the recession on vulnerable people, NZCCSS has released its fifth issue of the Vulnerability Report covering the first quarter of 2010. In our press release we observe “that the unrelenting pressure on social services in our communities continues despite the small drop in the unemployment rate”. Concerns are also raised about the direction of welfare reform. As our Acting President comments “the fact the Government has told the [Welfare Working] Group it cannot consider whether the level of benefit payments is adequate means they will not be able to properly address the poverty that underpins most of the issues we see in our client families”. Economic inequality and poverty are the drivers of vulnerability, a theme also picked up in the Public Health Advisory Committee Report on child health released last week. Last week I attended the Welfare Working two day Forum in Wellington. Our newly formed Welfare Working Group has been tasked with finding ways to ‘reduce dependency’ and is looking to models used in Australia, the UK and the US for guidance. A number of speakers at the forum discussed the welfare approaches take by other OECD countries. There was however a sense of predetermination about the event. It seems rather pointless to be hearing about what other countries are doing when the government has already put forward its ideas in the form of the Social Assistance (Future Focus) Bill currently in Parliament. Paula Rebstock, chair of the WWG has also spoken to the media about putting time limits on benefits and their interest in employment insurance models. Comments like ‘the dream is over’ by the Minister (Paula Bennett) and from John Key– that some beneficiaries need a kick in the pants, are also unhelpful and add to the sense the direction of welfare reform is a foregone conclusion. Others at the forum also shared this view. Kaye Brereton from the Wellington Peoples Centre asked Did anyone listen? She felt WWG members missed an opportunity to hear about what many interesting and capable people are doing at the grassroots with families reliant on benefits. • Our welfare system is in crisis and unaffordable, particularly with the high number of people on the DPB, Invalids and Sickness Benefits. • We should be looking at what countries like Australia and the UK are doing in treating most beneficiaries the same as people on the unemployment benefit – NZ is out of step with other jurisdictions in how leniently it treats DPB, SB and IB. • An ACC-type, social or employment insurance model for welfare must be seriously considered. We at NZCCSS are very concerned at the direction of welfare reform. The Terms of Reference and the scope of the WWG are too restrictive, as is the expertise in the group. Quite tellingly there are no beneficiary group represented. • The welfare system must be considered as a WHOLE. Tightening up criteria for one benefit type will invariable leads to 'spill over' into another benefit/s. • It is impossible to separate the welfare system from the tax system. They are inextricably linked and reforms should be also. • The trajectory of each benefit has its own story and history so it is erroneous to generalise across benefits. For example the trends for the Unemployment Benefit are closely aligned with the economic cycle; however, this is less the case for the DPB and not at all for Sickness and Invalids Benefits. • Governments around the world have struggled to 'contain' or 'reduce' benefit numbers and the associated expense. Until we have an accurate understanding of the elements that lead to increasing benefit numbers, policy responses are likely to be inadequate and ultimately unsuccessful. Work and Income has not waited to find out how welfare reform will pan out before changing the way they interact with clients. Recently NZCCSS found out that beneficiaries who need an appointment now see the next available case manager in their local office, rather than waiting for their personal case manager. According a press release Work and Income head Patricia Reade said the change has boosted productivity - the number of clients each case manager sees each day - by 30 per cent. The new system is known as Lean Six Sigma, which has its origins in American manufacturing sector. NZCCSS is alarmed at this move as we believe it is contrary to the best interests (and good outcomes) for the most vulnerable. “If something is worth doing, it’s worth doing well especially when dealing with families under stress, and these are people who study after study shows benefit from personalised, careful and caring attention. Faster is not the same as better.” We couldn’t have said it better. • An agency being flexible enough to respond to individual needs. We also know from GRV that advocates will become increasingly important for people when they engage with Work and Income in order to get and keep their entitlements. The introduction of Lean Six Sigma is a very retrogressive step and we would welcome feedback from community groups regarding their clients’ experiences of the new system. Copies of Grassroots Voices (full report and summary) are available on our website under publications. The Beneficiary Advisory Service explains how the tax reforms announced in Budget 2010 will contribute to widening inequality. This is an issue we have raised with the government and is shared by other groups such a Child Poverty Action Group. Economic policies can be seen to directly impact on child health. A point made by CPAG member Prof Innes Asher in her presentation to the recent Welfare Working Group Conference. In a graph she shows a doubling in serious skin infections in 1994. Another graph shows that twice as many NZ children are living in poverty now compared with the 1980s with the early 1990s (and the mother of all budgets) identified as a ‘tipping point’. 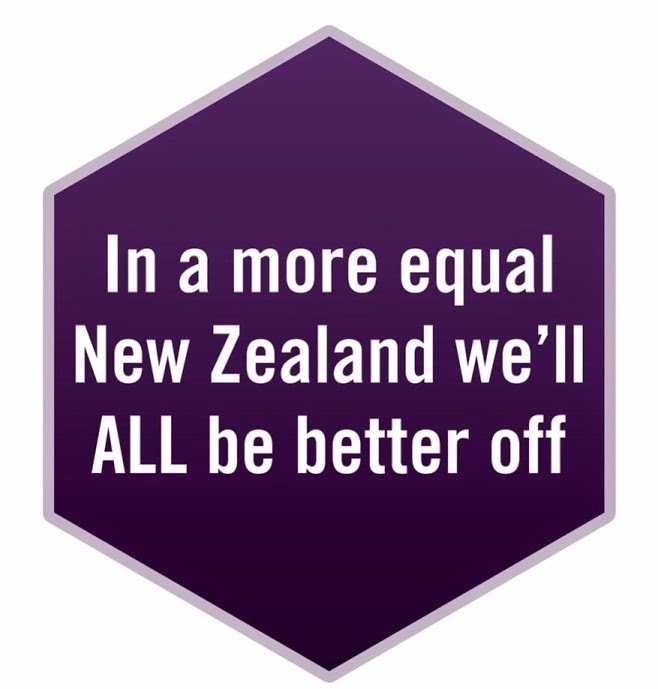 And on the issue of inequality listen to Chris Laidlaw’s Radio NZ on Sunday programme (June 6) interview Richard Wilkinson, co- author of the much mentioned book The Spirit Level. Richard argues that the more unequal a society is the more likely it is to suffer from social breakdown – one automatically follows the other. Bidding Against Ourselves has Driven Houses Prices? A thought-provoking opinion piece in the ODT by Peter Lyons, a teacher of economics, seems to put its finger on one of the key drivers in the increase in house prices and housing (un)affordability. He points out that during the housing boom 2002 – 2007, loose control of the money supply has created a lot of mortgage credit available which in turn has led to Kiwis bidding against each other for houses and driving up prices - pretty depressing. There has been a bit of media regarding Labour MP Carol Beaumont’s Credit Reform (Responsible Lending) Bill, designed to cap New Zealand's interest rates. The bill also requires lenders to make inquiries to ascertain that borrowers have a reasonable prospect of repaying loans. Fringe lenders in New Zealand prey on low-income people in poorer communities, seeking out the most vulnerable members of society and exploiting their desperate circumstances. We hope to support this bill should it get through its first reading. ONE News reports on how the Emissions Trading Scheme is likely to hit consumers in the pocket.The emissions trading scheme is set to come into effect from 1 July this year. A number of commentators have alerted the public to impending price rises. From the perspective of NZCCSS we are concerned about the impact of these price rises on low income individuals and families. The ETS will hit in areas that are difficult to economise on. The National Foundation of the Deaf is alerting people to ACC’s new rules around hearing loss. “Under rules being rammed through a limited consultation process, people will get funding from ACC only for the portion of their hearing loss it says is caused by injury. Claimants will have to pay the rest.” The Audiology Society estimates between 58,000 - 70,000 people could be affected by the changes that mean part charges for hearing aids and fitting fees. NFD argues that it’s a nonsense to introduce a part charging regime when the science doesn’t exist to accurate assess what part of hearing loss is attributable to the natural ageing process. We share their concerns about the impact of this new policy on low income people who will not be able to pay the part charge. It will also disproportionately impact of the elderly, a large number of whom live on a fixed income. Does this mean delayed or no access to rehabilitation? This move is a classic example of how our ‘comprehensive no fault system’ is being systematically whittled away to save money. NZCCSS has made a submission largely in opposition to the Local Government Act 2002 Amendment Bill. In our submission we argue against councils’ having to operate within a fiscal envelope because of the impact of this on service delivery. We also stringently opposed the measures to “reduce the barriers to private sector involvement in the delivery of water services.” This is because we see water as essential to human life and provided by nature. The buying and selling for profit is therefore a violation of a fundamental human right. By transferring the management and decision-making control over water to private companies this Bill “transforms the provision of water services from a public good to a source of private profit”. A copy of our submission is available in the publications section of our website.